The Los Angeles City Council on Wednesday tentatively approved revisions to a law that prohibits the storage of property in public areas such as sidewalks, making it so that at least for now, transients will be allowed to keep 60 gallons worth of belongings. The move came over the objections of advocates for the homeless, who say the law essentially makes homelessness a crime. The council voted 13-1 to sign off on amendments -- including the 60- gallon provision -- to the city law known as 56.11 that prohibits tents and other living space to be set up between 6 a.m. and 9 p.m. and currently does not allow any storage of personal property in public areas. Because the vote was not unanimous, the ordinance will return for a second and final vote on April 6. Councilman Gil Cedillo voted against the revisions. He said there was no need to adopt such a measure because there are other laws that could address concerns raised today by homeowners and others about criminal activity, obstruction of accessibility in public areas and unsanitary conditions associated with homeless encampments. Councilman Mike Bonin said he was not completely happy with the ordinance, but considered it an improvement over the one now on the books, which only allows homeless individuals to keep as many belongings as they can carry. The City Council has been under pressure to strengthen the law against legal challenges from advocates for the homeless, and to avoid being seen as criminalizing them. Top homeless services officials for the city and county also urged the city to change the law to remove any aspects that would criminalize homelessness, saying that failing to do so would jeopardize about $110 million in federal funding needed to provide housing and other services to the homeless. The City Council voted last November to amend the law to remove aspects that could be seen as criminalizing homelessness. Earlier this month, the U.S. Department of Housing and Urban Development awarded the first chunk of the funding -- $84.2 million -- to the Los Angeles Homeless Services Authority. But the City Council did not move until today to approve the actual language of the amendments promised last fall, and advocates for the homeless say the revisions still contain criminal penalties and provisions that would punish the homeless for being forced to live on the streets. Under the revisions, it would be unlawful for homeless individuals and others who refuse to take down their encampments during the day or prevent a city employee from doing so. It would also be a misdemeanor if an individual delays, resists or obstructs a city employee from moving, removing, impounding or discarding personal property stored in a public area. Homeless individuals would be allowed to store a 60-gallon bin's worth of belongings -- including deconstructed tents, bedding, clothes, food, medicine, documents and other personal items -- on the sidewalk as long as they are attended. The city could still impound property that is left unattended and any property that is in excess of the 60 gallons, under the revised ordinance. City attorneys said earlier this month the amendments are aimed at giving the city a way to keep sidewalks clear and accessible while allowing homeless individuals to keep some belongings if there are no other places to store them. Assistant City Attorney Valerie Flores told the Homelessness and Poverty Committee that the 60-gallon provision was included in the hope of striking "the right balance," but added that "this is sort of uncharted territory" in terms of whether the courts would accept it. She said the provision is an improvement over the existing law, which "did not allow anything a person couldn't carry." "We do believe this is a lawful ordinance and a court would appreciate the dueling interests that we're trying to serve and hopefully uphold the ordinance," Flores said. 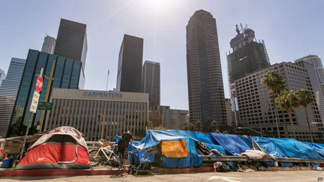 Attorneys with the Legal Aid Foundation of Los Angeles submitted a letter to the council earlier this month voicing concerns that even with the amendments, the ordinance remains unconstitutional and would continue to criminalize homelessness. "The adoption of the proposed ordinance and the inevitable enforcement creates significant sanctions against homeless people and gives unprecedented authority to city employees and contractors to seize and destroy homeless individuals' property," the attorneys wrote. "In doing so, it violates the United States Constitution." They added that the proposed ordinance fails to take away criminal penalties, and keeps "significant elements that criminalize homelessness." The proposed ordinance could cost the Los Angeles area the remaining $24 million in HUD grants being sought by the city and county's joint homelessness services authority "at a time when the city and county can scarcely afford to lose a single dollar in federal funding for the homeless," the attorneys said in the letter, which was also sent to Los Angeles Homeless Services Authority Executive Director Peter Lynn and HUD Secretary Julian Castro. Shayla Myers, an attorney with the Legal Aid Foundation of Los Angeles, told City News Service today that the city has had a history of being sued over laws like 56.11. "The policies and practices of seizing homeless peoples' property has led to significant litigation" dating back to the 1980s, Myers said. She did not say if the Legal Aid Foundation is planning to take legal action against the revised 56.11, but said there are "significant legal issues" with it. She pointed to an ongoing lawsuit filed by the Legal Aid Foundation and other attorneys on March 14 that alleges the city continues to improperly seize and destroy the belongings of the homeless and to falsely arrest them. "What we have seen and the basis of (this lawsuit) is that the LAPD and the Bureau of Sanitation are seizing and summarily destroying peoples' property when it is taken," Myers said. The revised 56.11 law again gives the police and city sanitation workers "significant authority to impound homeless people's property," Myers said.